Though R.E.M.’s 1983 debut, Murmur, has remained in frequent rotation for me over the years, I hadn’t really thought about lead singer Michael Stipe’s lyrics much until recently. Then something happened that made me think about them a bit too much, and made me consider the pleasure of not quite knowing what I was listening to. On a vacation that involved a fair amount of driving, my wife and I took an iPad loaded with our favorite albums and took turns choosing which to play. She selected Murmur, and when it arrived at “Perfect Circle,” a beautiful ballad that’s remained part of R.E.M.’s live set even as other early songs have fallen away, she noted that she had no idea what the words to the chorus were. Neither did I. So I looked it up. I regret that. It’s not that the words I found, after consulting sites like allthelyrics and metrolyrics were bad. They are, for the record, alternately “Standing too soon, shoulders high in the room” and “Heaven assumed, shoulders high in the room.” It’s just that I’d spent all these years not quite knowing; I always caught the “shoulder” and the let the rest kind of the words slide around it. And that was okay. R.E.M.’s often indiscernible lyrics had long been a topic of conversation when, in 1988, the band broke a long tradition by printing the words to one of its songs in the liner notes of its then-new album Green. This doesn’t seem like such a big deal these days, and even by 1988 it wasn’t as big a deal as it might have been a few years earlier. Listeners wouldn’t have had too hard a time discerning the words to that song, “World Leader Pretend,” or the words to most of the songs on Green. By the end of the ’80s, lead singer Michael Stipe had begun enunciating more clearly, addressing less opaque subjects, and opening up a bit more in interviews, particularly when talking about songs that intersected with his politics. Anyone who cared to pay attention to such things knew “Orange Crush” was about the use of Agent Orange in Vietnam, even if the words remained oblique. Yet to see Stipe’s lyric laid out without any ambiguity, even for just one song, felt a bit like a shock. Here was a singer whose earliest efforts used words as a means of expression that hid as much as they showed. This was never more pronounced than on the band’s full-length 1983 debut Murmur, the subject of hushed conversation for years to come. Murmur’s jangle made R.E.M., for a time, the most-imitated band around. 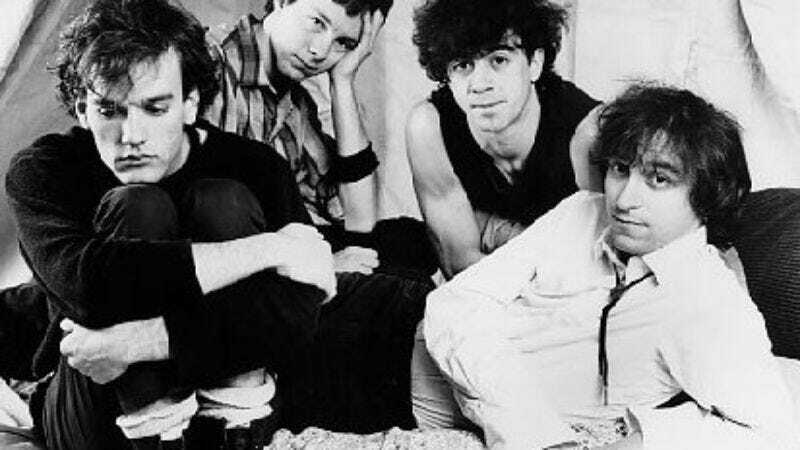 But if others could make careers, or at least land deals, with passable imitations of Peter Buck’s Byrds-inspired guitar lines, Mike Mills’ restless basslines, and Bill Berry’s insistent drumming, Stipe’s vocals remained inimitable for several reasons. To make a tired observation, Murmur is just about the only possible name for the album. The band and producers Mitch Easter and Don Dixon put Stipe low in the mix. He sometimes sounds less like an active participant in the recording than a spirit haunting the song. It’s often not clear what he’s singing, and when the words are discernible they’re evocative fragments and not fully developed thoughts: “Lighted in a room.” “Calling on, in the transit.” “So much more attractive inside the moral kiosk.” They’re confounding. And perfect. And much of the pleasure comes from not quite understanding them. The song’s lyrics end on a tag line after the chorus, which I’ve never been able to decipher properly. Just before the guitars begin their quick, cathartic crescendo to the fadeout, Pollard can be heard singing either “Promise to lead you” or “Promise to leave you.” Or maybe both. So far it’s the closest thing I’ve come across to a clue in this mess. Hip-hop’s a genre that favors clarity and narrative directness, so it’s all the more startling when a rapper can turn those expectations on their head. Ghostface has proven himself a talented storyteller, but I particularly like songs like “Nutmeg,” from 2000’s Supreme Clientele, when he just seems to be piling words together for the sheer pleasure of it. “Hit Poughkepsie crispy chicken verbs throw up a stone Richie / Chop the O, sprinkle a lil' snow inside a Optimo.” It’s possible—let’s just say likely—that lines like these might seem clearer if I were better versed in the Wu-Tang mythology or understood all the infinite synonyms for cocaine Ghostface and Raekwon in particular have committed to wax over the years. But, as it is, I just like the way one word flows to the next. Maybe Pollard and Ghostface have specific inspirations in mind. I’m not sure it matters. Just as I’m not sure it matters that “You Won’t See Me” was inspired by Paul McCartney’s failing relationship with Jane Asher. Or if Craig Finn had models in mind for Holly and Charlemagne. Or if “There She Goes Again” is about love or heroin, when I like the possibility it's about either or both. A good song grows bigger than what inspired it. Lyrics are there for a reason, but they’re not always there to be understood. I was shocked when a friend told me, shortly after I first began to get into music, that he hardly paid any attention to the words and neither did most people he knew. I used to listen intently to Talking Heads songs trying to figure out what they meant, and confident that they meant something concrete I could discern if I just paid careful enough attention. I didn’t know I was right, but in the wrong way. Squeeze them too hard and the words lose all their meaning. But wait long enough and the lyrics to, say, “Once In A Lifetime” and “Seen And Not Seen” will seem like truth itself. 1 Not that it’s without ambiguity; listen to it and tell me if the guy is literally a car thief or not. 2 That’s not quite as unusual as it sounds. If you passed through Dayton in the 1990s and played an instrument, chances are you would have joined Guided By Voices for a time, too. 4 A final thought on the perils of obsessing over lyrics: Sometimes you can never hear a song the same way again. I will not spoil a song for you that was once spoiled for me, but let me say this: If you take one of a great Canadian songwriter’s most famous songs and simply capitalize two words, what once sounded profound will forever sound quite silly, if only for a second or two.